but I have never seen an episode of Dr. Who. I'm sure I'll watch it someday. I totally LOVE Matt Smith's art on the IDW comic series. 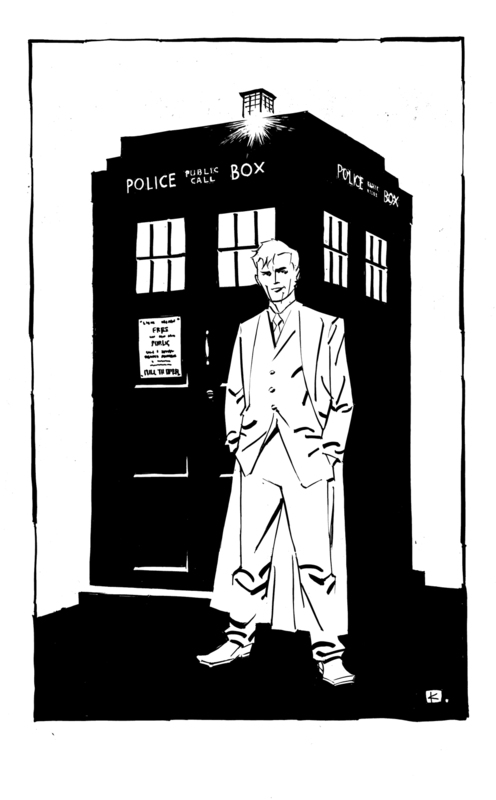 It's late, but here's my Dr. Who drawing, such as it is. PS- I have a batch of artwork up on EBAY this week. If your interested CLICK HERE. Thanks! Great illustration, by the way. Especially the way you've used contrast between the Doctor, the Tardis, background. Seriously great - atmospheric, stylish, totally wonderful. Love the little gleam of light poking in from the TARDIS roof! Andy, this is classy stuff. So smartly done. Great, great work. Love the play of black and white on this, Andy!